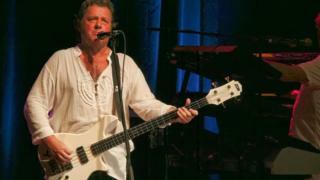 Asia star John Wetton has died aged 67 after a battle with colon cancer, his bandmate Carl Palmer has said. According to a brief statement released by the band, Wetton passed away in his sleep on Tuesday morning. Wetton played bass and sang in King Crimson, Uriah Heep and Roxy Music before fronting supergroup Asia. Palmer said on Facebook: "With the passing of my good friend and musical collaborator, John Wetton, the world loses yet another musical giant." He said that Wetton - who co-wrote and performed on Asia's debut hit in 1982, Heat Of The Moment, as well other tracks including Only Time Will Tell - had been a "gentle person". "As a musician, he was both brave and innovative, with a voice that took the music of Asia to the top of the charts around the world," he said. "His ability to triumph over alcohol abuse made him an inspiration to many who have also fought that battle. For those of us who knew him and worked with him, his valiant struggle against cancer was a further inspiration." Palmer said Wetton's death came as "quite a shock", although he had been aware his friend's health had been "pretty bad" in recent weeks. Wetton recently pulled out of the supergroup's forthcoming US tour supporting rock group Journey to have chemotherapy, and he also stood down from other touring commitments before that. Palmer, 66, said: "We weren't being told exactly what was going on. John wanted to keep a positive face - he wanted to try to get better, which is understandable." Palmer's Emerson, Lake & Palmer co-stars Keith Emerson and Greg Lake died last March and December respectively. Wetton is survived by his wife Lisa and son Dylan.